The Bad Kitty Bakery: A book? Me? I have decided to finally get off my booty and start working on a book. Yes, there are many good vegan cookbooks out there (and some stinkers) but I do have something to add to the conversation. What I am curious about is does anyone have anything they would like to see in a cookbook? Any recipe additions? Anything? Let me know. Also, Jason and I are back to the gluten free diet for a while. To help us out, we ordered a new breadmaker!! It is a convection oven that is meant to make fluffy gluten free bread. When it comes, I will let you know how it works. Now, without further delay, here is the new recipe. This will be in my book so let me know if you like the format!! Line a muffin tin with papers. Preheat the oven to 400 degrees. In a bowl, mix together all the dry ingredients. In a separate bowl, cream together the oil and sugar. Add the lemon juice and ‘milk’, along with the lemon zest and lemon extract. Once combined, it should be thick, but still be able to be spooned into the muffin papers. Place a small layer of dough in each paper, then top with fruit. Repeat two more times. Once the muffin papers are full, sprinkle with the 2 tablespoons of granulated sugar. Place in the oven and bake for 25 minutes. Allow to cool slightly, remove from the pan, and allow to cool completely before removing the papers. What do I eat with this? Fresh hot coffee or tea would be perfect for these light breakfast muffins. What equipment do I need? Measuring cups, spoons, bowls, mixing utensils, muffin papers, and a muffin tin. What else can I do with this recipe? 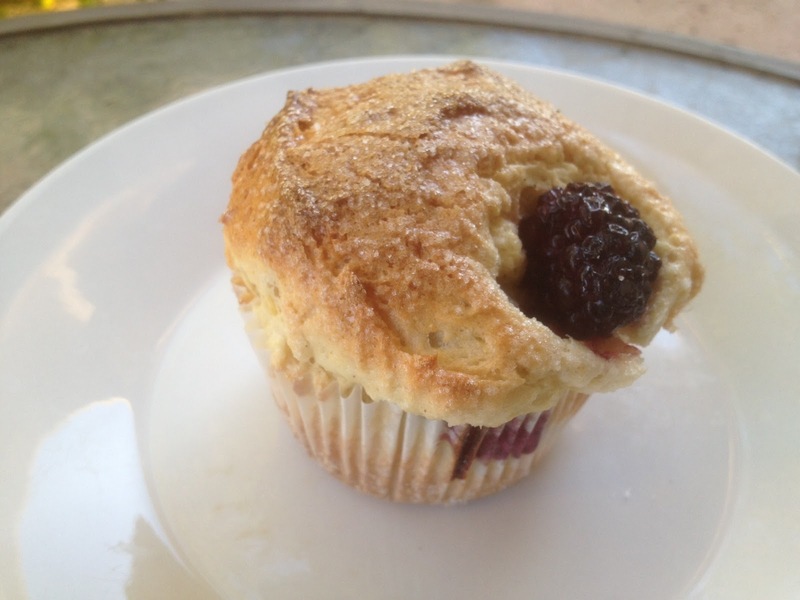 Instead of blackberries, use fresh plump blueberries, for lemon blueberry muffins. Or, even go a different route and use 1/3 cup of chopped walnuts mixed with 1/3 cup dried cherries for Walnut Cherry Lemon Muffins. Top with a generous sprinkle of walnuts and granulated sugar. But only do this if you want to impress everyone with your gourmet awesomeness. What was the inspiration? I had lemons on my tree and blackberries that needed to be used. Sometimes, it is as simple as that. Any funny stories about this recipe? These were created after a local news channel wanted to feature me and my cooking classes on air. They wanted me to create what I was making that night, plus provide a lot of ‘healthy produce’. Knowing that all produce is healthy, I grabbed what looked good including a lot of berries. After getting only a few hours of sleep the night before I raced down to the studio, set up… and after 45 minutes they told me I was cancelled and to leave. I packed up my food, including the blackberries that became these muffins and left to get a nap before my cooking class that night.